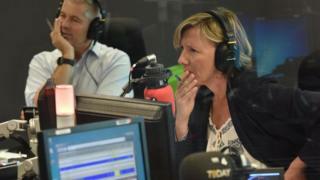 BBC Radio 4 presenter Sarah Montague said she was "incandescent with rage" when she found out she was being paid less than her Today programme co-hosts.Montague wrote in The Sunday Times that she felt her She was the only Today host that did not appear on the BBC's list of those earning ?150,000 or more last July.A BBC spokeswoman said it was committed to closing its gender pay gap by 2020.Before the BBC's top earners list was published last year, Montague said she suspected she was paid less than colleagues, but felt "some moral high ground from taking less of the licence fee than others". The list showed Today programme hosts John Humphrys earned between ?600,000 and ?649,000, Nick Robinson ?250,000 to ?299,000, Mishal Husain ?200,000 to ?249,000 and Justin Webb ?150,000 to ?199,999. "What a fool I was," she wrote. "I felt like a sap".Montague, who moved to Radio 4's World At One programme last month, said her ?133,000 wage for hosting Today was a "very good wage for a job that I loved".But she said she "hadn't clocked just how professionally damaging it would feel" to know she was earning less than her Today colleagues. What is the gender pay gap? Some of the BBC's most high-profile female presenters have criticised the corporation for not closing the gender pay gap, while former BBC China editor Carrie Gracie resigned from her post early in 2018, citing pay discrimination.Montague, 52, said it never occurred to her that she would be paid less than male colleagues when she joined the corporation in 1997, as a news channel presenter. "I had long suspected that I was paid much less than my colleagues but until the pay disclosures I had no idea of the scale of that difference," she wrote. "Some years ago I was even assured by a manager that I was not the lowest paid on the programme. "The BBC, which has revealed a gender pay gap of 9.3%, compared with a national average of 18%, said it was introducing a "clear and transparent pay framework" in the future. Airbnb wants to get into streaming media… because why not?